As part of a series we’re calling Who We Are, we’re working to build and connect our community by interviewing the talented, dynamic parents and staff who make up the people of Villa di Maria. Today, we meet Thomas Jöstlein, musician and father of two here at Villa di Maria. He and his musical family are an integral part of our community, often contributing the the musical culture of the school. On Symphony day, Thomas can be seen waving to the students of Villa di Maria (he’s the tall one in the back of the orchestra with a wide, friendly smile). Villa di Maria: Thank you for taking the time to talk, Thomas! What is it that you do, career-wise and also any hobbies you enjoy? Thomas Jöstlein: Thank you for having me! 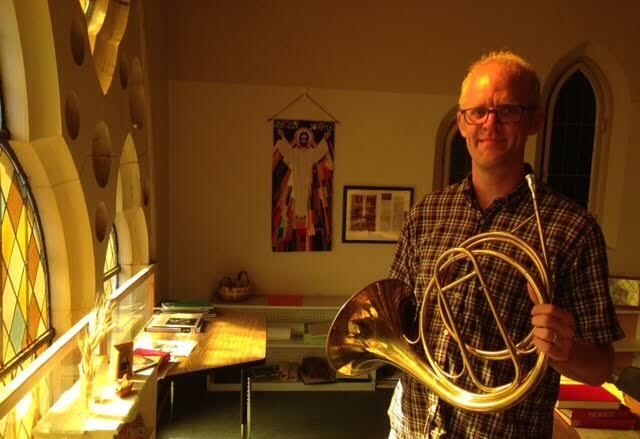 I play French horn in the St. Louis Symphony. I’m in my 7th season. Before settling here, I’ve been able to travel all over the world. The most exotic tour I’ve ever done is playing a live international broadcast in North Korea in 2008 for the New York Philharmonic. As far as hobbies go, I really enjoy tennis, and reading German books to my boys in the morning. I also enjoy playing cello with my youngest son in the morning. My wife Tricia practices violin with our oldest son. Most of all, I enjoy exploring the world with my kids. VdM: What is it about Montessori that appeals to you and Tricia? TJ: We were introduced to Montessori through a parent at our previous school who suggested that we check it out. Our oldest was six when he started here. We did a tour of the school and met one of the lower elementary directresses and just really liked her. Also, seeing the calm in the classroom, the constant work and focus of the children on their work was a huge selling-point. It’s meditative, really. And the cooperative element speaks a lot to me as a member of a 90-piece orchestra. In my job, that’s essential. There is a cooperative system in Montessori that is so much like that world. There’s a teaching system in Venezuela called El Sistema, which is a publicly-financed voluntary music education program, where once a child learns an instrument or song, they immediately teach the younger students. There’s a parallel with that program that I see in Montessori that I really love. The mixed-age classrooms encourage that dynamic, as well as providing an opportunity for children to move ahead in a way they wouldn’t if they were stuck in restrictive same-age, same-grade classrooms. We love the mixed-age classrooms. It’s not fraught with competition; rather, it’s collaborative. VdM: What advice would you give to parents who are interested in Montessori? TJ: Talk to parents of current Montessori students. It’s the best way to learn about the method and what it’s all about. Of course, also visit, because there are different Montessori schools, so it is important that you see the place for yourself. Thank you, Thomas! We are so happy that your family is a part of this wonderful community! Villa di Maria Montessori School offers Primary (ages 2 1/2 through 6), Lower Elementary (ages 6 through 9), and Upper Elementary (ages 9 through 12) education. This blog gives a look inside our school, as well as insights into the Montessori approach to education. For more information about our school, please visit our main site at http://www.villadimaria.org.